Yay! I've read this one. I read this as part of the 2015 Classics Challenge and I really enjoyed it. I loved the film when I was younger and although the book was quite different it still had that sweet and exciting story with an undercurrent of darkness that you don't usually find in children's literature. You can find my review here, and this one is still definitely on my shelf. Pretties is the sequel to Uglies and it's part of a trilogy, the last book being Specials. I honestly can't remember much about this series except for the general concept of teenagers living in a dystopia being given plastic surgery and being brainwashed. I'm pretty sure I didn't enjoy Pretties that much and I didn't even read Specials. I much prefer Scott Westerfeld's Midnighters series and I don't own the Uglies series anymore. Now this next one is interesting because I neither read it or own it anymore. I can't even remember anything about it without looking it up. It's apparently about a school shooting and I clearly decided that I didn't want to read it enough to keep it - I have way too many books on my TBR to keep books I'm unsure about! The Summoning is another one that I didn't read and don't own anymore, I think this was another impulse purchase to get the 6 books for £5 deal. I definitely don't buy books just to get a deal now because I've learnt that I only end up giving them away if I'm not super excited about them. I believe this one was a paranormal YA, but it really didn't grab me. Last Exit to Brooklyn is still on my shelf but as yet unread, which I feel pretty bad about as this haul was over two years ago! I've contemplated giving this one away a few times but for some reason I've held onto it. It is supposed to be a modern classic so maybe I should pick it up? If you've read this one, let me know what you thought and whether I should keep it! Another one I haven't read yet but is still on my shelf, Everything is Illuminated got a lot of hype a while back on booktube and I think that's why I picked it up. I have read Extremely Loud and Incredibly Close which also got a lot of hype, but I didn't love it, it was okay but I'm not sure Safran Foer's writing style is for me. Again, let me know if I should keep this one! And finally, yet ANOTHER book I still own but haven't read yet, this is kind of embarrassing! I'm definitely going to read The Goldfinch at some point because I've heard so many good things about it. It's just such a hefty book that it's kind of intimidating! It's definitely on my mental to-read-soon list! 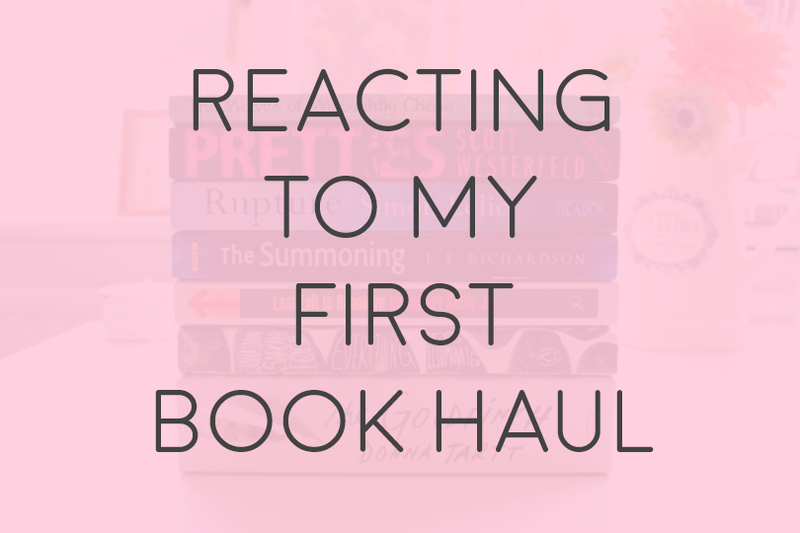 So that was my reaction to my first ever book haul, that was fun! I think I'll make these more of a regular thing so let me know if you'd like to see that! I also feel like I have so many exciting looking older books on my TBR but I never get to them because I'm always reading proofs and new releases. Do you have any advice on fitting in backlist titles? I'd love to know!